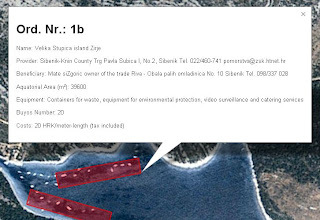 The croatian Ministry of Sea, Transport and Infrastructure (MPPI) provides a Concession List that lists the official licensed Nautical Anchorages in Croatia. You can find this List (it's an Excel-Sheet) here (Select "Nautical Anchorages"). Since this Sheet is not very handy to use aboard, I created a little piece of software that adds the information and coordinates of the Sheet to Google-Maps. 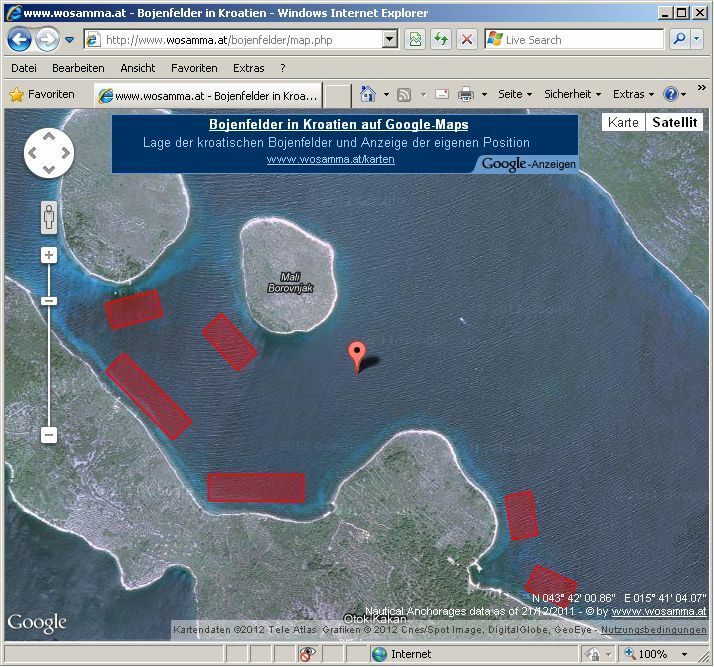 You can find this Google-Map here, and this is how it looks like. 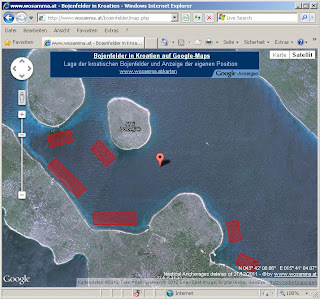 Inside this Anchorages, Buoys are available and a fee has to be paid for usage. Anchoring with your own anchor is prohibited inside the concession area. Since summer 2012 anchoring with your own anchor was also prohibited at distances up to 300 m around this Anchorages, in Autumn 2013 this was reduced to 150 m.
The Map is also available for free as WebApp via Amazon (see here) and Firefox (see here). 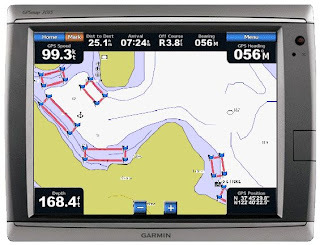 The Map should work with all modern Computers, Tablets, Smartphones, iPhone, iPad a.o. Here you see how it looks like in an iPad. If your Device supports Geo-Location (via GPS or IP-Adress), the actual position is displayed in the Map as a red Google-Marker. If you move around, the Google-Marker moves with you and tells you exactly where you are. So, basically, the Map acts just like a Chartplotter. 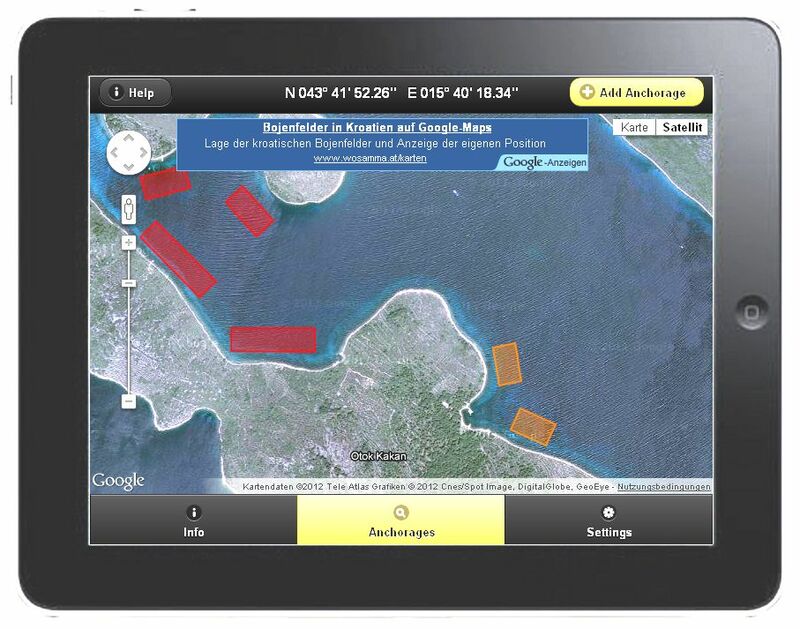 When you click on an Anchorage, the informations from the Concession List and links to additional informations are displayed. You can read Name and Address of Provider and Concessionaire, Buoys number and Costs of each Anchorage﻿. 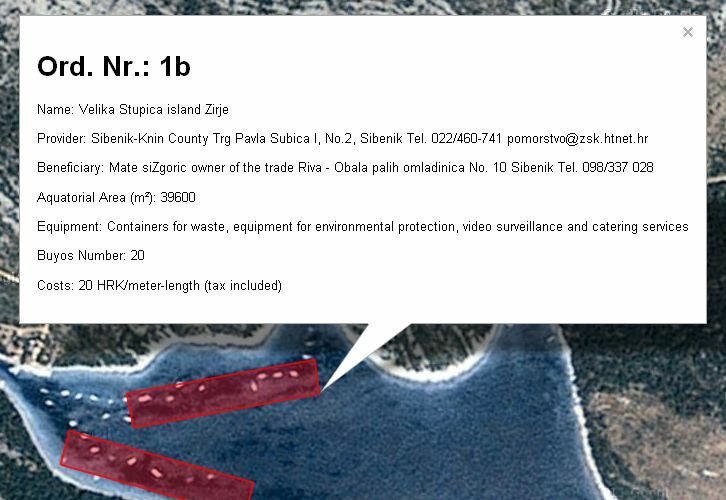 If there is additional information from the croatian Ministry available for this Anchorage, a direct link to the corresponding information is offered. 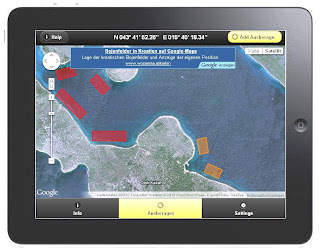 If there is information in the blog available for this Anchorage, a direct link to the corresponding post is offered. You can download the Map as KML- or GPX-File for import in a Chartplotter. Here you see how it looks like in a Chartplotter.